We, the Jewish people today, all stand as survivors. Not from the Holocaust necessarily, but from our ancient, hate filled history. The destruction of the first Temple, the destruction of the second Temple, the Bar Kokhba revolt, the numerous pogroms, the exiles, and the continuous persecution of the Jews to this day are all unforgotten attempts of vanquishing the Jewish people. Time and time again we are oppressed to the point of almost extinction. Yet, we are still here. A more recent example of these attempts at ridding the world of the “Jewish problem” is the Holocaust. The Holocaust, an integral yet horrific part of Jewish history, occurred in many places throughout Europe. Beginning in Germany, the Nazi regime soon occupied and controlled nearby countries, such as Poland, which was a base for many concentration and death camps. In order to intimately learn about the Shoah, we went to Poland to see many of the relevant places that related to the Holocaust. Our trip encompassed many ghettos, former Jewish settlements, concentration camps, and death camps. Comprehending each destination was difficult considering we were standing in a spot that used to be so active with Jewish life, but now there are no Jews left. When traveling around Poland, the spectrum of life and death witnessed made the entirety of the history and stories taking place at each destination more meaningful. During our Masa (trip) to Poland, we experienced the amazing life that was created by the Jewish people. Tykocin, a vibrant Jewish shtetl since 1642, perfectly defines what a lively community would entail. This community thrived on the sense of unity it embodied. It was no stranger to pogroms, which are anti-jewish riots, but through the adversity they still were a prosperous society. On every Shabbat, there would be an active market in order to prepare for the evening. One of the communities biggest attributes was their willingness to help each other. When it came time for Shabbat, some families realized that they did not have as prosperous of a week as anticipated. This became problematic when collecting materials needed to celebrate Shabbat. So, when this unfortunate circumstance came about, other members of the community would lend them a chicken or some bread for that week, and the next week the family would repay them with an item they need. Another part of the community that depicts the life that was once there is the ancient cemetery. This cemetery, one of the oldest in Poland, portrays the life based upon the generations that are buried there. The dilapidated cemetery is now barely even recognizable as holy place that Jews were once laid to rest. However, as I walked past each grave, I was still able to make out some of the inscriptions engraved on them. Some read “mom”, “grandfather”, and “rabbi”, proving that the society flourished for so long to have to have multiple generations and classes of people represented. While learning about the Holocaust, it is often easy to forget about the life that once existed before. These people had their own traditions, lives, and feelings, and it is more important to commemorate what once existed rather than just the way it ceased to exist. The Nazi’s eliminated the previously thriving life at Tycocin, was eliminated by the Nazi’s in August 1941. The residents were all gathered in the market square, which once represented life, but this action foreshadowed the demise of their society. From the market square, they were taken to the nearby woods in a town called Lopuchowo. As we approached the woods in complete silence, the eeriness of the whole situation began to hit me. Each tree seemed to bear witness to the atrocities to which they were exposed. The trees are bare and no beauty remains with them. I feel as though this is how the Nazi’s wanted the Jews to feel, stripped of all positive things, both physically and mentally exposed. But then, a sense crossed my mind of how wrong it was that we were going to visit this site. It was not supposed to be this way. The Jewish people were no longer supposed to exist. Here we are taking the same path that our ancestors traveled. The only difference is that we were going to leave the woods alive. On the days of August 25th-26th, 2,000 Jews were murdered in three mass graves, completely wiping out a society that was once brilliant with life. The people carrying out these acts of terror were called the Einsatzkommando, and they were in charge of looking each person in the face and shooting them. Men, women and children were all killed in this incredibly personal, face-to-face method. It is simple to think of the number 2,000 as a whole; however, picturing each individual person, every family, and the friendships that intertwines everyone, makes the horrific scene begin to dawn upon you. Each life has a story, and every life matters. The concept of breaking down the numbers and looking at each number as an individual being is the only way to retain the legacy of lives that were terminated too soon. Yiddish words are personal to each family. Everyone has a memory of a relative or some figure saying a yiddish word to them like “kepe” or “puddum”. To me, these words represent a sense of comfort and familiarity when spoken to me. A new word that was introduced to me, and now the most important one in my quaint Yiddish vocabulary is “iberleben”, meaning small acts of resistance. Iberleben is especially relatable to the Jews of the Holocaust, because that is how they survived. They were the small acts that made the ghettos, concentration camps, and other difficult situations in their lives a little more bearable. For children, ghetto life was especially confusing and difficult. All the time there were children left orphaned because of the random murders and separations that took place. Janusz Korczack, who embraces the concept of iberleben, set up an orphanage for children in the Warsaw ghetto. The ghetto walls formed their own version of endless hell for the people living within them, but the orphanage created a safe haven for the children of the ghetto. Within this orphanage, Korczack set up the rules based on democratic values. Each of the children had a say in the system; this was very important, since at this time, they had no say in anything happening in their lives. Eventually, the ghetto was to be liquidated, and the children were the first to go. They were to be marched to the nearby Jewish cemetery and shot so they would fall into pits. Janusz Korczack was aware of the encroaching fate that was about to end all of these young lives before they had even begun, as well as his life. It is important to note that Korczack had the option of not going to die right then, but to prolong his life; however, he chose to die with his children. He had all of the children get dressed up in their nicest clothing, and get ready to parade around the streets expressing their youthful energy through song and dance. His preserved these children’s last moments as happy and not filled with terror. In the end, they all died together, and this act of Iberleben showed that some things cannot be taken away. Janusz Korczack gave these children a caring community when they needed it the most. Even with the acts of Iberleben, death still occurred. In circumstances relating to Iberleben, the physical occurrence of death is not the longstanding message, but the passive ways that people were able to resist under the Nazi regime. There are 613 recognized mitzvot. However, the most important mitzvah is not even included in this group. Rabbi Fackenhiem once wrote the 614th mitzvah: “Jews are forbidden to hand Hitler posthumous victories, they are commanded to survive as Jews, lest the Jewish people perish”. My generation, the last that will be able to talk directly to Holocaust survivors, has an added responsibility making sure later generations are educated about the Holocaust. Continuing the Jewish tradition is very important, because, as the quote states, if we relax our Jewish values and morals too much, Hitler would be rewarded with a victory. It is important for every Jew to realize the obligation they have to continuously carry out the successes of our people. Personally, in order to follow Rabbi Fackenhiem’s 614th mitzvah, I know that I will raise my children Jewish. As well as raising my children Jewish, I will instill upon them the importance of implementing the Jewish traditions for the rest of their lives and the generations to follow. Along with the continuation of the Jewish people, I will educate others about the Holocaust, ensuring that am yisrael, the Jewish people, will continue forever. 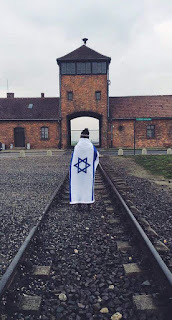 Stepping into each concentration camp, death camp, ghetto, and any other place where the Jewish people were cruelly and unjustifiably persecuted increased my connection and pride to my Jewish identity. The feeling of being in the exact place where these incomprehensible tragedies occurred is nothing like I have ever felt before. My disbelief is completely logical considering I should not be able to understand why or how these events could take place, simply because I am incapable of having such hatred towards a group of people. It is not normal to be able to hate a group of people and dehumanize them as much as the Nazis did. However, these sadistic people exist in all societies, and were able to create the the horror of the Holocaust. It is our job as the Jewish people to keep that from happening again.